More than most men, Woodrow Wilson needed women. He needed their love, their support and their companionship. In the confines of his home, he surrounded himself with women. He had two wives (sequentially), one mistress, and three daughters. Theirs is a complex story of love and politics. In this book, Ellen and Edith come alive as real persons and not just appendages to their famous husband, even though they eagerly took on the job of helpmate as their major role in life. The author tells their story in an engaging manner while opening a new window on the character of our 28th President and the entire Wilson presidency. Born in Savannah, Georgia on May 15, 1860, Ellen Axson met Woodrow Wilson in Rome, Georgia when she was 23. A talented artist, she was convinced that no man was good enough for her. Both were the children of Presbyterian ministers with strong allegiances to the Confederacy, though her Southern roots were deeper. Woodrow was on his way to an academic career. Ellen quickly set aside whatever ambitions she had to become a model faculty wife. She translated scholarly articles from German and digested other material to save him time. She studied home economics so she could better manage her household and entertain his colleagues. In her spare time she reared and home-schooled their daughters. After Woodrow became President of Princeton University in 1902 her responsibilities increased. She had to entertain constantly, relieving her husband of a responsibility he did not like. She became his advisor on the intricacies of academic politics. All this was good training for her two years as wife of the Governor of New Jersey and then first lady. 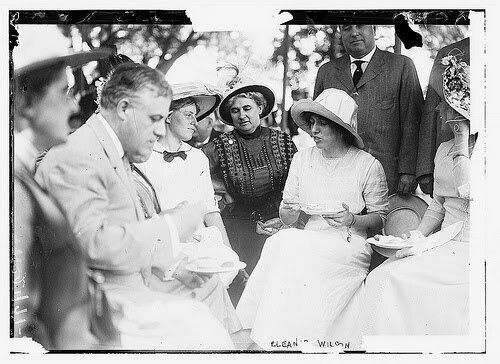 As Woodrow moved into electoral politics, she helped shape his ideas and write his speeches. Indeed many thought that she was the better politician of the two. Woodrow and Ellen were a devoted couple, writing intimate and passionate letters to each other whenever they were apart more than a few days. This did not prevent him from establishing an intense friendship with Mary Allen Hulbert Peck, a married woman he met in Bermuda in 1907. Woodrow had been ordered to take a rest for his health; Ellen had stayed behind to care for an ill daughter. Wilson continued his relationship with Mary, writing and visiting her for years. Ellen was wounded, but the only change it made in their life was that she made more time for her own painting. Ellen was just as ambitious for Woodrow as he was. She wanted to be the wife of a great man. When he became President she continued to be his sounding board and chief advisor, sitting in on meetings and helping with his correspondence. She also lent her name and prestige to various charitable endeavors in addition to her own projects, one of which was designing the White House rose garden. Ellen died of kidney failure on August 6, 1914. Woodrow wept profusely; her death left him totally depressed and despondent. Friends wondered if he could carry on as President. Seven months later he found a balm for his pain. 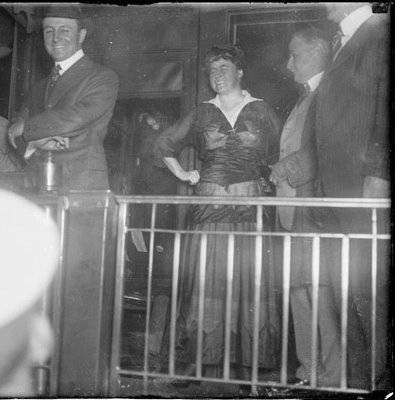 Edith Bolling had also married at 23, to Norman Galt in 1896. Born in a small town in Virginia, her formal education was spotty as her family was large and her brothers got preference. She married the son of a jewelry store owner in Washington, D.C., and herself became the owner in 1908 after the men died. Her only child was born prematurely, living just three days. Her route to the grieving widower was through Woodrow’s friend and personal physician, who was dating a friend of Edith’s. One contact led to another until Edith had her first dinner with Woodrow in the White House on March 23, 1915. Within a few weeks he had professed his love and was writing her daily. They married on December 18, 1915, later than Woodrow wished but still close enough to Ellen’s death to provoke some unseemly gossip. Before marrying Edith, Woodrow had to extricate himself from his relationship with Mary, who had divorced her husband in 1912. It’s unclear whether Woodrow was no longer emotionally attached to Mary at the time Ellen died, or whether he did not think she would make a suitable first lady. Whatever the reason, he did not call her to his side, though she seems to have expected as much. After he became engaged to Edith, he sent Mary a “Dear John” letter. He also sent her several sizable checks as she was in financial straits. Despite rumors that Mary might publish some of Woodrow’s letters to her, there was no scandal. Once married, Woodrow could seldom bear to be away from Edith, sharing his work as well as his leisure with her. She would often read dispatches to him from abroad, or decode messages and code his to be sent oversees. She made phone calls for him, reviewed his speeches and generally acted like an extension of his own self. Although Edith had long tasted independence, she devoted her life to a man who, according to her social secretary, “needs love and care more than any I have ever seen.” She rose with him at 5:00 a.m. to make him breakfast in order not to disturb the servants. She watched over his diet and his exercise, and made sure that his work was interspersed with some fun. The extent of Woodrow’s disability was not disclosed to the public, though there was much speculation that he had suffered a stroke. Even when word leaked out after four months of dissimulation, it was still unclear how ill he was. Woodrow had long suffered from high blood pressure, but at the time the only treatment was rest – which became impossible during the treaty negotiations in Europe and the fight for the League. Now Edith made sure he got plenty of rest, mostly by not letting anyone with official business see him at all. When Woodrow’s mind was able to function some of the time, Edith took over the task of deciding what matters should be brought to his attention and what should be delegated to others in the Administration, or simply ignored. She thought work would help restore him to heath if it wasn’t too strenuous or upsetting. Edith watched closely over her husband, acting as his gatekeeper, determining which public business was important enough to take up his limited time and energy. She spoke with the officials who wanted to talk to Woodrow and decided whom to allow into his sick room. Decisions on appointments and other matters were announced by her. All this led to speculation that she had become the first woman President. While it’s unlikely that she made any decisions, she gave the impression that she was more than her husband’s amanuensis. There was little pressure for Woodrow to resign, partially because no one knew how much or how soon he would recover. Vice President Thomas Marshall made no effort to take over. He had been kept out of the loop since taking office in 1913, tasked solely with presiding over the Senate. Edith knew more about the affairs of state – thanks to four years of Woodrow’s tutelage – than the Vice President did. After his Presidency ended, the Wilsons moved into a newly purchased house in Washington. Woodrow did some writing, but he was very frail, dying on February 23, 1924. Edith lived there another forty years, sharing the house with one or more siblings until her death on December 28 (Woodrow’s birthday), 1961. She spent these decades promoting her husband’s legacy, controlling access to his papers, and generally being the dean of all First Ladies. Others may have thought that she was the woman who would be President, but she never did.